In a milestone launch contract award for SpaceX, the Californian company will use of its two Falcon 9 v1.1 rockets to loft Germany’s second-generation radar reconnaissance satellite system into orbit in the latter half of this decade. The launch contract for the three-satellite SARah Constellation marks SpaceX’s first deal with a European government. The big win for SpaceX comes just a month after the German government signed a contract for the construction of the three military imaging satellites, in a deal worth just over one billion dollars. OHB System AG will build two passive-antenna synthetic aperture radar (SAR) satellites, while Astrium GmbH will build a larger, phased-array-antenna satellite, under contract for OHB. The three reconnaissance satellites – due to be fully operational by late 2019 – will provide services to German armed forces. The constellation will replace Germany’s existing fleet of five SAR-Lupe reconnaissance satellites, which will begin to come off line in late 2017. 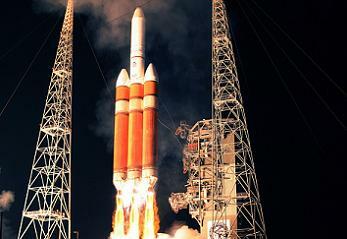 The SAR-Lupe fleet were launched as Germany’s first reconnaissance satellite system. 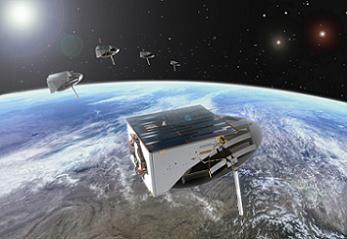 The five identical satellites – each weighing in at 770kg – were developed by OHB-System AG. The constellation operates in three 500-kilometre orbits in planes roughly sixty degrees apart. The first satellite was launched from Plesetsk in Russia in 2006, with four more satellites launched at roughly six-month intervals, prior to the entire system reaching full operational readiness in the middle of 2008. The new satellites, collectively known as SARah, are set to be constructed by 2016, before being delivered to orbit by two Falcon 9 rockets in 2018 and 2019. One F9 launch will loft the two passive-antenna SAR birds, with the other F9 launching with the larger phased-array-antenna satellite. SpaceX have been busy advertising their capabilities to government and military customers since their early years. Their main target is back in the United States, after making no secret of their ambitions to win contracts currently undertaken by the United Launch Alliance via the Evolved Expendable Launch Vehicle (EELV)-class missions, which are launched by ULA’s fleet of Delta and Atlas rockets. SpaceX then claimed the “stranglehold” on the US Air Force market appeared to be loosening, following a Memorandum of Understanding (MOU) between the USAF, the NRO (National Reconnaissance Office) and NASA that opened up the possibility for the likes of SpaceX to compete for the launch contracts. Last year saw a breakthrough for SpaceX, winning two EELV-class missions to ride on their Falcon 9 and Falcon Heavy rockets in 2014 and 2015 respectively. The launches, which fall under the United States Air Force Orbital/Suborbital Program-3 (OSP-3), will mark SpaceX’s debut for this class of mission. SpaceX’s Falcon 9 v1.1 is set to debut next month – pending launch site and vehicle readiness – lofting a made-in-Canada small satellite called the “CAScade, Smallsat and IOnospheric Polar Explorer” (CASSIOPE) in orbit. This first v1.1 vehicle – which is also set to enable SpaceX’s fully reusable rocket ambitions – is currently undergoing integration and processing operations at SpaceX’s Vandenberg launch site in California. The debut of the F9 v1.1 will kick-start a very busy period of launches for SpaceX, with a sign of their upcoming manifest frenzy seen via a photo of several Falcon 9 stages undergoing manufacture at the company’s factory in Hawthorne. 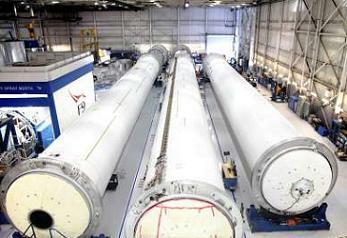 The photo shows the first stages for flights 7, 8, 9 – along with second stages for flights 8 and 9 – on the factory floor, with one unidentified stage and octoweb enjoying a trip to the “SpaceX Falcon 9 spray booth”. With 2013 set to close out with the launch of the fourth Dragon spacecraft to the International Space Station (ISS) – known as CRS-3 (SpX-3) – SpaceX will then debut their big Falcon Heavy launch vehicle sometime in 2014. SpaceX also recently announced the award of a reservation contract that lines them up as the launch service provider for three satellites that will make up the RADARSAT Constellation Mission (RCM). That agreement, with MacDonald, Dettwiler and Associates Ltd. (MDA), calls for the satellites to ride uphill on a Falcon 9 in 2018. (Images via SpaceX, DLR and ULA).